Sorry for the lack of updates once again. I've been insanely busy at work that I'm usually there early and yet still the last one to leave our "cave". I'm just trying to learn and get a better understanding of my job. So needless to say, I've been coming home really tired at the end of the day, and sleeping late is hardly an option since I have difficulties waking up bright and early. Anyway, the Cool Heat collection from MAC released today, June 12. I decided to check it out and take advantage of the 15 percent coupon that MAC has miraculously sent out to their customers yesterday. I guess with the recent downturn of our economy, so did their sales hence why they offered this discount. But being a recent business graduate, I still wanted to hold on to my weak dollar by spending it wisely on something I will actually use while satisfying my inner MAC addiction without going overboard. 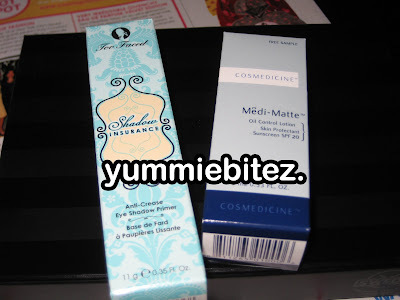 I also checked out Sephora and finally got the Too Faced Shadow Insurance and got a sample of the Cosmedicine Medi Matte Oil Control Lotion. The Cool Heat collection has some hit or miss for me. 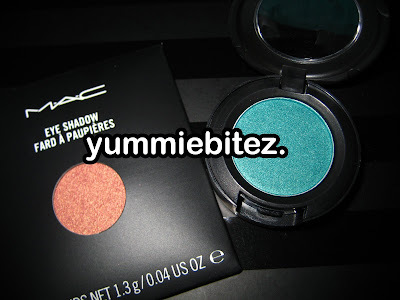 The rest of the eyeshadows can be substituted with a permanent color. Solar White can be duped with Femme Fi (Neo Sci Fi) or with Naked Lunch (permanent). Gulf Stream is almost similar to Parrot in my opinion. But, I did get it since I don't have Parrot. 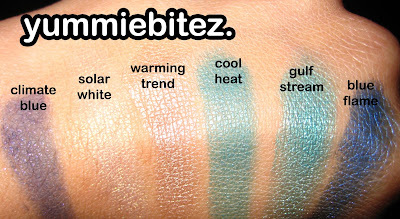 Blue Flame can be subsituted with Deep Truth (permanent) as Vanessa had observed and mention while we were swatching these babies today. However, Deep Truth has a better color payoff than Blue Flame which looks a little flat or too matte for its color. Warm Chill (not pictured) was a miss for me since it seemed too sheer for my taste. And lastly, Warming Trend just reminds me of my Milani Sheer Sand. Other misses are Cool Heat and Climate Blue. The texture of these eyeshadows seemed to be chunky. As for the Neo Sci-Fi Collection, these colors are more up in my alley (yes, I'm aware that I'm a bit late for this information). However, like the Cool Heat collection, it can be easily be duped with a permanent color. 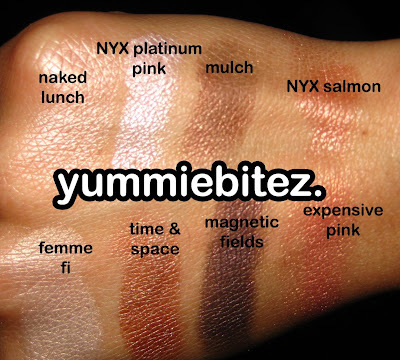 As mentioned earlier, Femme Fi can be duped with Naked Lunch; Time & Space is similar to Woodwinked; and Expensive Pink with NYX Salmon (trio). The only slight difference I noticed with Expensive Pink vs. NYX Salmon e/s was Expensive Pink is a little bit more on the peachy side than the NYX Salmon. I passed up on getting the Magnetic Fields since I thought it looked like my Milani Java Bean, but it wasn't. The closest color with Magnetic Fields that I have is Brun, except Brun is a matte color while Magnetic Fields is more on the frosty side. So, I might have to go back in getting Magnetic Fields after all. I hope this helps with anyone thinking about getting something in this collection. 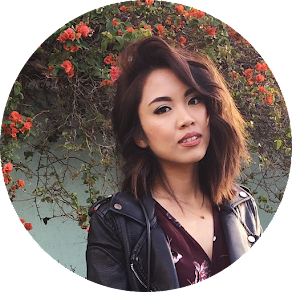 For the past weeks, I've been analyzing every single eyeshadow I own to justify why they should stay in my stash. As much as I am a beauty addict/junkie, I still have to weigh in some benefit or purpose for my purchase especially with gas prices going up, the dollar getting weaker, rice shortages, and the economy slump. We only have two sets of eyes and one lips. How much makeup do we really need? Creativity doesn't come from the amount of eyeshadow you own, but how you can utilize on what you have. But sometimes it's easier said than done to stop an addiction. I wonder if it counts if I get my sister to buy it for me, lol. I didn't get any shadows from Neo Sci-fi. I just got the blushes and a lippie. And I got a bronzer powder from Future Earth (or is it Solar Field?? IDK...too many names). Hope the job is going well!! Hola my Anne! It was fun hanging out with you yesterday even if it was only for awhile! HAHA I love our Best Friend, I was cracking up when that guy was talking to her, I am like "sir do you need Lasik surgery?!!" LOL. I don't know why she is so UNFRIENDLY, and I am even nice to all the MUA's there, but she is just weird, lol. Anyway, "Magnetic Fields" is so gorgeous! I love it! I wish they made that color permanent because it's so gorgeous! It's really unique, it's dark and frosty, it's a color I gotta stock up on! LOL. We shall do dinner soon, maybe next week? I will check my sched! welcome back. haven't seen u in forever! how's life after college? @shen: It's probably because of the angle I took the picture. However, content-wise, Too Faced has 0.01 oz more than Urban Decay. I mean it's not a substantial difference I think, but I do like the packaging of this better since you don't have to chop it off to get all the product out. You just squeeze the tubes and out it goes. Staying power... we'll have to see. I'm currently testing it right now. @gee: If she buys it for you and you don't have to pay her back then it's not. It's considered a gift. haha. @tracy: It's weird. I don't have school anymore. I miss school and my long breaks in between. After clicking blog after blog, I ended up here. I really like your 'Cool Heat Collection Swatches.' 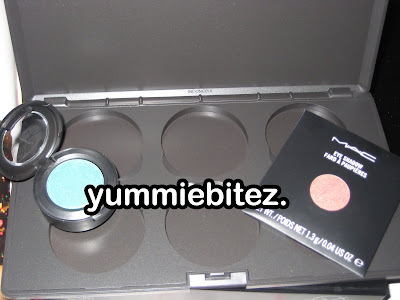 I stopped by the MAC store & I wasn't really feeling them, but after seeing your swatches... I kind of want them now. Anyway, you graduated from CSUN? I'm starting my sophomore year this upcoming semester. Bleeeeh, you're so lucky you're done with college! Yup, very small world! And yeah, of course I'm staying, even though it's a pain at times. I'm majoring on Computer Science (which just makes it so much harder). What did you major on?